Getting cancelled for part of a scheduled shift at work is often a problem during a recession, but on Friday I volunteered to go home at noon when our patient census was low. David and I planned to leave early Saturday morning for the Oregon Coast, but since he had Friday off, I packed quickly and we left that afternoon instead. Getting cancelled for half a shift felt like a gift instead of a loss in this circumstance, and my coworkers who wanted the hours were happy. The way it looks depends on your point of view. I am in Newport, Oregon looking at a 180 degree view of the Pacific Ocean, with a blue heron nesting in a nearby fir tree. Last night I thought I heard a small dog barking, but it was the heron. What surprisingly harsh squawks from such an elegant bird! I see the heron in a new way. 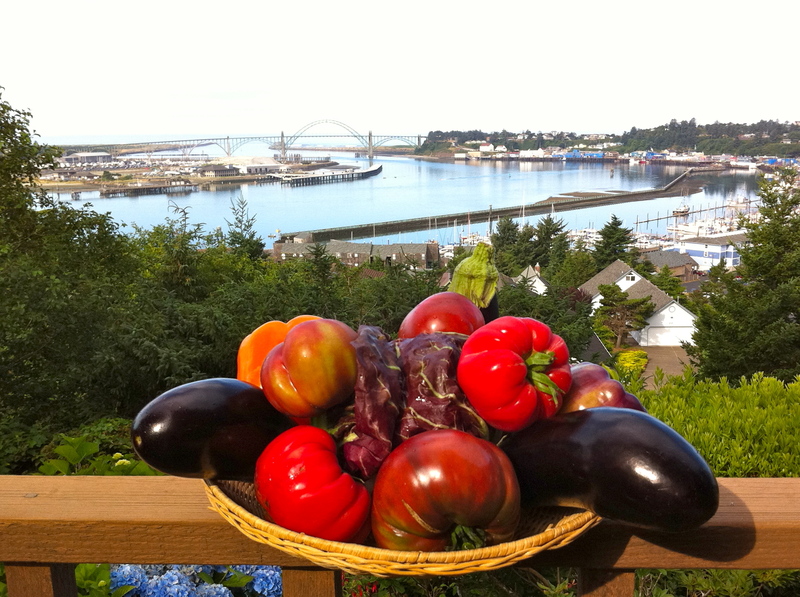 Saturday morning at Newport’s Farmers’ Market we bought heirloom tomatoes, slender eggplants, a radicchio with red leaves edged in light green, and purple, yellow, and red peppers. Although we are traveling, I couldn’t resist the beauty of the vegetables, and when we paid for them even the farmer commented on the remarkable colors. Although he’d set up the booth himself that morning, he saw them from a fresh perspective while weighing them on the scale. At the locally owned JC Market (which has a surprisingly good wine selection) I bought a bottle of Oregon Pinot Noir and a Pinot Gris. As I carried the brown paper bag through the parking lot, I saw Don’t change the way you look, change the way you see, written on a sticker pasted to the bumper of a parked car. I knew a pilot who said when he entered any public venue such as a movie theatre, the first thing he did was locate all the exits in case of fire. It makes sense that a pilot would see a theatre that way. After all, how to exit the plane in an emergency is the first thing taught to commercial jet passengers. For a long time, I viewed many opportunities through the lens of their worst possible outcomes. I believe I learned this behavior as a nurse, seeing the traumatic outcomes of choices written on the bodies of patients in the ICU. Jobs requiring an exceptional sense of responsibility for the safety of others, such as piloting a jetliner, or nursing, affect our view of life, creating habits within our personalities, which I believe are unique from most of our society. It took me awhile to realize nursing influenced my enjoyment of life, and not always in a positive way. For instance, I used to make choices based on their potential for risk or emotional pain. “Hope for the best, but plan for the worst,” was my viewpoint. Now I look at choices for their fun value too, not only potential peril. Otherwise, I may miss seeing the movie by worrying that the theatre might catch on fire. Don’t change the way you look, change the way you see. Bob’s Red Mill: 5000 SE International Way, Milwaukie, Oregon, uses antique millstones to grind whole grain products, which they package and sell. On weekdays you can tour the mill, then head over to the grain store and restaurant to buy products or have a hearty meal. I had the eggs and grits for breakfast, but could have had French toast, waffles, or one of many other choices from the bakery or espresso bar. Family friendly, Bob’s Red Mill has a vast selection of gluten-free products too. Bob’s steel-cut oats are an international award winner (also available gluten-free). If you buy some to take home, be sure to buy a hand-carved spurtle (Scottish porridge stirring stick) made by artisan Tim Cebulla from native Oregon myrtle wood. The Meadow: 3731 N. Mississippi Ave., Portland, Oregon. Okay, I know about sodium and high blood pressure, but it’s worth learning the discipline of moderation to shop at The Meadow. This unique establishment sells salt from all over the world. I think of it as geology for my kitchen. 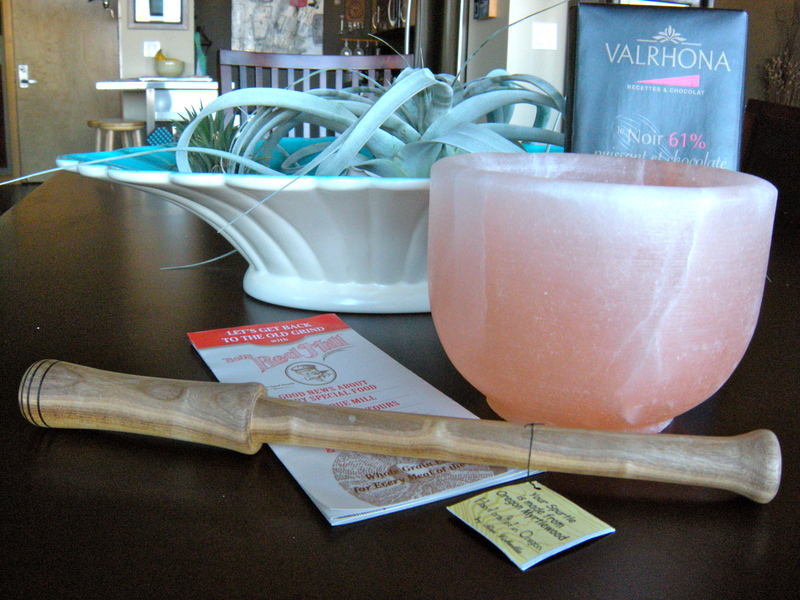 As a return customer, I already own one of their salt starter sets, and a bowl carved from pink Himalayan rock salt. So, I bought a bar of imported dark chocolate to melt directly in the salt bowl for dipping fresh strawberries and bananas into. The knowledgeable salesperson provided complete instructions on how to do it. Besides salts of the earth, The Meadow also sells a large assortment of fine chocolates, wines, and fresh flowers. Pistils Nursery: 3811 N. Mississippi Ave., Portland, Oregon, is down the street from The Meadows. A marvel of design in a very small space, Pistils is a nursery and chicken habitat in a converted old house. Nestled in a largely residential neighborhood, my husband wondered how they keep their free-roaming, exotic chickens within the fenced yard. I’m curious how they keep the neighborhood cats out. At any rate, this homey version of a full-fledge nursery is a delight for the senses. I am kicking myself that this was one of the rare times I was without a camera. You’ll have to go see for yourself. My husband and I recently entertained guests from out-of-town. One of the fun things we did was visit Powell’s City of Books in Portland. 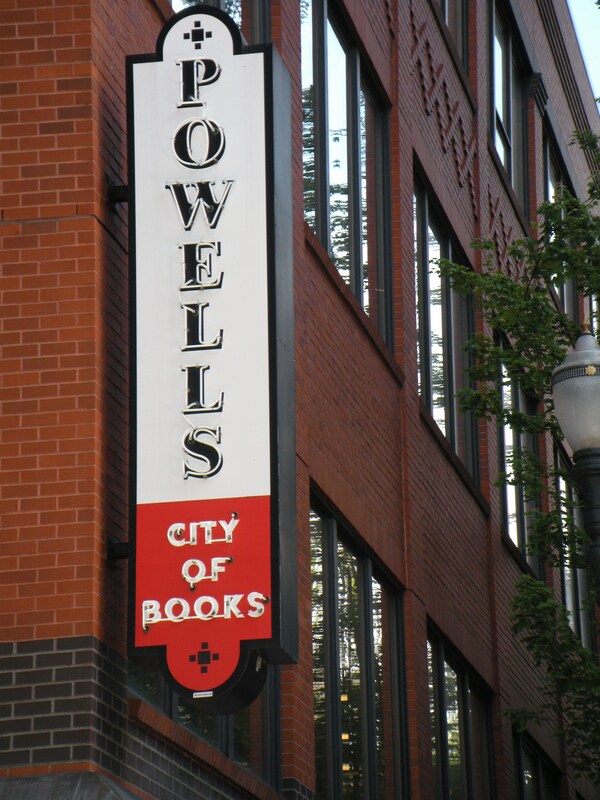 Powell’s on Burnside is the largest bookstore in the world, a reader’s Paradise. Rooms of books sprawl from floors of multiple staircases, like levels of heaven. It is so big; the store provides maps for customers, like Disneyland. If you visit Powell’s, allow at least two hours. Like making a painting, you never finish going through Powell’s, you just reach interesting places to stop. Of course, I bought some books while we were there. Three came from the Pearl Room, where the art books are shelved. In the Gold room, I found a copy of American Pastoral by Philip Roth. I’ve meant to read Philip Roth since I read Night Studio, a memoir by Musa Mayer about her father, the artist Philip Guston. The two Philips were friends, as painters and writers often are. That is not why I bought American Pastoral. I bought the novel because I’m reading books from the Books to Read Immediately list in How to Read like a Writer, by Francine Prose. An award-winning author, Prose teaches writing the way my instructors at Pacific Northwest College of Art taught painting: study the work of the best, and imitate what they did. It sounds so simple: study masterpieces. This kind of observation is about getting inside the artist or writer’s head, understanding the choices they made, and why each decision contributes to the masterpiece. The next step is to take that why and store it like a tool in its box, until an opportunity for use presents itself. That sounds simple too, except that the trick, the magic, the craft, only occurs if one wields the tool in a fresh, new way. Restating something said before needs to reveal a unique voice. That is what makes the work a piece of art: craft and a unique voice. As I meandered through the rooms of Powell’s, it occurred to me that craft and unique voice are often missing in nursing innovation. How many times are manufacturers of IV tubing and connector systems replaced in a hospital? That is not innovation; it’s changing vendors because the current vendor contract has expired and the hospital is shopping for a new one. Real innovation is finding ways to improve, for instance, staffing in a damaged economy. It is seeing old ideas in a fresh new way. Hospitals move slowly towards change, as if lumbering freighters pulled along by tugboats in a busy harbor. Nurses resist change too. For instance, we complain about understaffing, and about losing hours (pay) when hospital census is low. Not enough nurses leaves a unit under staffed, but too many nurses means not enough working hours for everyone. Dilemma is part of the business of health care. Problems have answers; dilemmas are ongoing and need management. Reduced paychecks due to lost shifts were particularly painful when I was a single mother with a mortgage. After awhile, the vacation paid leave dried up too. I needed cash. Therefore, I became agreeable to floating from PICU to related units, like NICU and general pediatrics. It wasn’t always comfortable going to an unfamiliar unit and taking patient assignments, but I found if I went with an open mind, spoke up about what kind of assignments were appropriate for my skill level, and won over a buddy or two from the unit, floating wasn’t that bad. I took CE courses in NICU subjects, including NALS and improved my skills. That improved my comfort level and patient safety. Social networking the old school way, I made friends in the units where I floated, and rarely lost a shift of work. Each new skill embellished my résumé; adding to my marketability. It’s a good tactic for nurses wanting to look experienced, instead of just aging, to employers. Hospital administration plays an important role in successful floating experiences for their nurses. It is critical that they understand it takes more than a body with a pulse and a stethoscope to care for various patient populations. Years ago, I attended a meeting organized by the hospital. Its administrators asked nurses what would encourage us to float. I pointed out that while I was able to sustain a critically ill child on life support; if floated to labor and delivery I could reason that a slow heart rate on a fetal monitor was probably not a good thing, but all I would know to do about it was scream for help. The administrators listened, and created float area “bundles,” limiting the departments nurses are asked to float to by related acuity and skills. 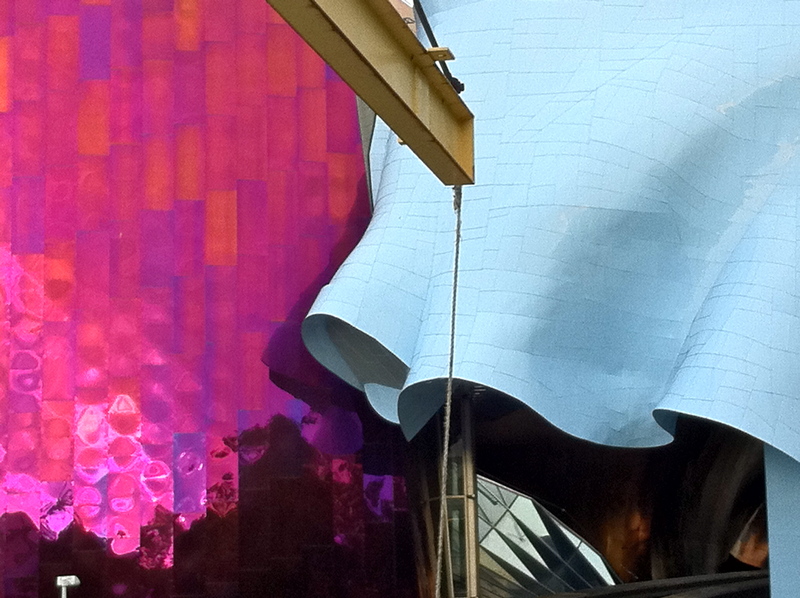 The tugboats helped navigate the freighter in this case. I am grateful to have a career that provides so many opportunities for work. In this economy, nursing is one of the few jobs with any security at all. It also provides opportunity for creative souls. Taking advantage of the beautiful fall weather we’re having in Oregon this year means a road trip, and we are in eastern Oregon this weekend. The geography is very different from Portland. Yesterday, we visited the Newberry Caldera and climbed the Big Obsidian Flow, a 1,300 year-old, outpouring of black, glass-like stone, valued by native communities for making arrowheads and knives. I saw a snake, warming itself in the last of the autumn sun. Last weekend David and I drove out to Hood River, Oregon for lunch. Afterwards we took in the “Fruit Loop” and bought apples and pears at one of the many fruit stands. Inspired by the autumn still life on my kitchen counter, I made this incredible salad of fall flavors. Heat half of the olive oil in a large skillet. Add sliced shalots and saute till tender, 2-3 minutes. Add curry powder and cider or pear juice. Bring to a boil and reduce to 3/4 cup; about 4 minutes. Transfer to a large bowl. Add the vinegar. Let cool. Heat the remaining olive oil in the skillet and add the shrimp. Season with salt and pepper to taste. Saute shrimp just until they curl and are pink. Place on a dish. Add field greens to cooled curry and shalot dressing; toss. Add chopped apple, dried cherries, and toasted cashews; toss again. Divide into 4 servings in bowls and top each with a serving of sauted shrimp. Serve with whole wheat pita. You know how it goes, when you’re a nurse. You work your assigned holiday weekends. It’s fair. Sometimes, the department you work for has a low census, and your shift gets cancelled, because they don’t need you. I got cancelled for the entire holiday weekend, due to low census. This feels like a gift from the universe (but it actually was Friday’s charge nurse who made it happen), after working my tush off all week installing The Acorn Contains the Tree and “One more than four” at Anka Gallery. bags in the back of the mighty Subaru yesterday afternoon and took off for Newport, Oregon, to watch the fireworks display tonight. Some well earned R&R.